Airfree is the natural solution to asthma, respiratory allergies, and mold. 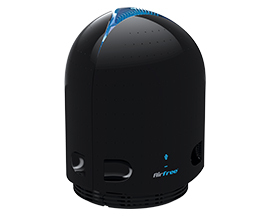 Eliminates dust mites, bacteria, fungi, virus, pollen, allergens of domestic animals, and other microorganisms from the air. This patented Thermodynamic TSS Technology destroys mold, dust mites, bacteria, viruses, pollens, pet dander, tobacco, and other organic allergens. Airfree also reduces indoor harmful ozone levels. It is perfect for mold contaminated areas as well as asthma and allergy sufferers. Airfree’s exclusive technology is completely silent and does not require any filters or maintenance. We use this in Callan's bedroom, and he has not been sick all winter.